St Andrew is the most north-easterly of the Saints, and cut off from most of the others by the Bungay to Halesworth road, it tends to be fairly independent of the rest of them. Away from the main road is this pretty little Methodist chapel. We're not far from the Norfolk border, and although Suffolk is by comparison with its northern neighbour more generally Baptist country, they seem to be fairly thin on the ground in the Saints. In fact, at the time of the 1851 Census of Religious Worship, there were very few non-conformist congregations at all around here. The suggestion is, of course, that the Church of England in these parts was very low church and evangelical, with the possible exception of South Elmham St Margaret. The incumbency of the Anglican parish church in St Andrew was unusually still held in plurality in the 1850s, by a Dr Gilbert, the head of Bungay Grammar School. He had been in charge since 1809, when such arrangements were more common. It was one of four churches whose livings he enjoyed, and all the hard work was farmed out to curates. This may help explain why less than ten per cent of the parish population regularly attended the parish church. This chapel was one of the beneficiaries. Built in 1840 by the local Wesleyan Society, it had just 18 members, but a regular attendance of well over a hundred. It is a pretty little building, with windows in the early Victorian style when Gothic was prefered but still pre-ecclesiological. The white portico on classical columns is a curiosity. It is always a pleasure to come across a building like this in the East Anglian lanes, especially in such an outback. The non-conformist chapels are reminders of a time when religious differences were taken seriously, and there was little truck with 'ecumenism' and the like. More than that, they were focuses of more than just religious dissent, and the divisions between church and chapel often reflected local class fault lines. 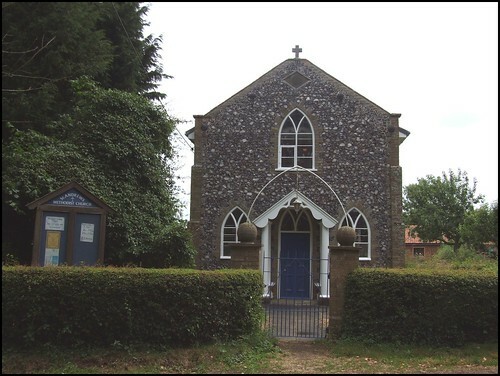 Landowners who were non-conformists would generally expect their employees to follow suit, but if they were Anglicans they could easily prevent the building of chapels in their parishes. A number of Suffolk chapels are away from their villages, hidden down back lanes, sometimes actually inside the edge of a neighbouring parish. The lack of non-conformist congregations at the time this chapel was built should not lead us to place to much too much emphasis on the influence of the local Church of England parish churches. In a place like the Saints, there was easy access to the multiplicity of denominations in the neighbouring town of Bungay, which in 1851 was able to boast buildings for Anglicans, Wesleyans, Primitive Methodists, Congregationalists, Baptists of two persuasions, and that tiny grouping which barely appears on the radar of the 1851 census, but which 150 years later would be the largest practising denomination in England: the Catholics.